Go, Tracy, Go! : Believe it or not, I really don't like blog drama. Believe it or not, I really don't like blog drama. I'm having trouble getting the message header to show in gmail, but I sent this email last night at 7:54pm. I usually post my blog first thing in the morning before work, but I held off some to give him a chance to answer. And I waited. I figured he'd seen my email but just didn't have an answer. Fair enough. I noticed partway through the day that he'd posted on facebook that we'd know the exact date of the race in "mid-December." He'd said in the original email that it would be "the first week of December." Not too big of a difference, but it still suggested to me that there was still just much too much TBD to be collecting race entry fees from this race. In the opinion of this blogger. Who has an audience of, say, 250 readers on a really good day, about 100 of whom are me hitting refresh. Honestly, when I got his messages, I was upset. Call me overly sensitive, but it had never been my intention to insult someone whose work I might not always agree with but mostly respect. But then, after I calmed down and reread my post and his responses, after a couple of my cyberfriends also commented on yesterday's post (thank you, Mike and AR), I was kind of bewildered and confused. I hadn't insulted him. I'd disagreed with the way he is running this race, sure. But personally insulting him? Not so much. Let me stress something: I think NYCRuns is a great idea and a good company. I do not have a problem with them or their races. Unfortunately, I do think their Founder and Race Director needs to learn how to communicate better. Less reactionarily. Coming up tomorrow: I tell you about getting locked out of my apartment after a run and nearly freezing to death and other stuff that is completely not controversial to anyone but me in any possible way. If you call my communication propaganda in your lead - expect a response. I consider that an insult. NYCRUNS is my baby. If you can't handle engaging with your subjects - you shouldn't blog about them either. Runners - we may not get every detail right (believe me) and you may not agree with everything we do (you won't) but we are listening to every one of you. "We may not get every detail right" sounds like a good motto for your organization. I know for the BK Marathon they noted their no refunds policy, but also emphasized that if the field didn't open, the entry fee could go towards another race or be donated. Which is a way better policy than most other races! I just don't understand why they opened the CP Marathon for entrants when it wasn't final... I saw the NYC Runs tweet then noticed on FB that they provided an entrant count. I'd like to run it, but I also like knowing when my race will be so I will wait to sign up and hope that it's still open. I agree about opening the race before it's final. One of the emails I got from NYCRuns this morning (from another employee, not Steve) said that they'd be offering credits to people who register for CP but then can't do it because of a date change. Frankly, if the original correspondence - or anywhere on FB, even - had said that (instead of the blanket "Our standard no refunds policy will apply"), I would have signed up on the spot Monday night and been totally happy about it. Mirada - The way the city permitting system operates limits us in certain ways and it is very important that we respect that. However, its also important that we get the race announced and available to our core runners (local) first. Hence the decision to announce with a soft date. If we announced it differently - our core audience could have gotten shut out of the race and we don't want that to happen - we'd rather deal with administrative headache. In fact, the BM waitlist people were informed before anyone because they deserved to be. Tracey - if you had just waited a day for a response - you clearly would have gotten one. Instead, you went on the attack. It is behavior that can be damaging and has been in fact for other companies. If you are going to write about real people and real entities - you should set some standards for yourself imho. No offense intended. I have a journalism degree and operate very much in the public eye so I think about these things - a lot. And this is what is wrong with small businesses. Everyong is supposed to worship small business because they are "real people and real entities", but how can you really do that when Target employees have less attitude? I'm offended that someone with a journalism degree wouldn't know the difference between "its" and "it's." I hope you know more about organizing races than you do about the English language, but that doesn't seem to be the case. Your numerous posts on this blog shows that you, like me, don't really have anything better to do than to post rambling, stream-of-consciousness nonsense on the internet. You're in the wrong line of work. Her name is Tracy. Perhaps in journalism school you missed the part about getting people's names correct. Once, ok you're human we all make mistakes. Three times???? Disrespectful. And before you make the same mistake again, it is Miranda. Perhaps your company needs to hire a publicist/editor?? So if anyone has anything negative to say about his business, he's just going to throw a hissy fit? Absolutely ridiculous, it reflects poorly not only for the individual, but for the company he calls his "baby"
I'm glad that someone else from the company responded to you in a more civilised way. I like your races, I like your organization, I like your race swag. I like that you guys communicate with the runners and when I email you/NYCRuns, I get a personal email back within a timely manner. Even though your pool of runners is hundreds to thousands large, you keep a small business feel and are transparent in your communications, decisions and ideas. However, you're going to get feedback and not all of that feedback is going to be what you want to hear. In fact, some people are going to be downright nasty. Maintaining your integrity and positive brand image through the highs AND lows is what's going to set you apart from your competition and give you a good name. You're not going to please all of the people all of the time and you're even going to make some of your loyal supporters angry every once in a while. But it's how you emerge from these situations and how you present yourself and NYCRuns that is going to truly define you. Tracy didn't wrong you. She vocalized what many were thinking. She accepted the errors she made (i.e. BKLYN Marathon pricing) and corrected them ASAP. Had she waited for your response, nothing would have changed - the reasons for the blog would still be the same. Honestly, I don't care if you have a degree in journalism, biology or are a high school drop out. You run a great organization and because of that, you're a role model of sorts and you have to act like one. You have to think about what you say, how people will interpret it and the implications that come from it. You could have done a better job here. The communication that you (rightfully) pride yourself on could have been much better. But Stever, we all make mistakes and it's learning from them that make us stronger people and better leaders going forward. And I have confidence that you, your patrons, Tracy's blog readers and anyone else can learn something from all of this. 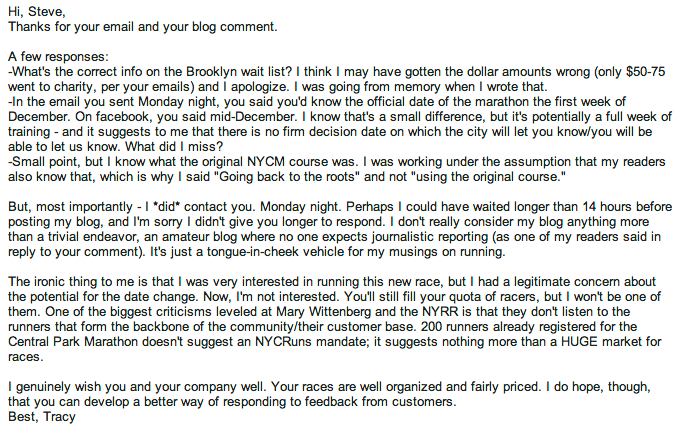 I will continue to support NYCRuns and I will continue to race with you. However, I won't be participating in your CP Marathon. But that's only because I have no desire to ever run a marathon again. Nee - thanks for your considered response. I agree with everything you said but I also believe that business owners have to respond to the good and the bad. I'm as quick to point out NYCRUNS's faults as anyone and I want to engage people who complain - always have. However, I also am going to defend the company when I see fit. Maybe Tracy vocalized what many others felt - a few wrote polite emails about it though and they received polite responses. She was the exception. No one has ever accused me of writing propaganda though.We go out of our way to be really transparent and most people realize that. Do you scream at drivers who cut you off too, or do you take the adult approach and go on minding your own business? Sometimes it's a trade-off between defending yourself and building up ill will. I understand what you're saying, but sometimes you have to be the bigger person. While I don't agree that Tracy was rude/out of line, etc., if and when you experience that, you just have to take the higher road and be polite back. We all hate sucking up our pride sometimes, but walking away knowing you're the bigger/better person is the right thing to do, esp. when you're in the 'public's' eye. I assure you that I'm keeping with that pledge - half marathons or bust. I do not intend to bust. I promised myself I wouldn't engage with Steve any further, but since he's using my blog as an open forum I did want to clarify something to anyone who might still be reading: I don't think of propaganda as a negative thing. The way I was taught in grade school, all advertising is inherently a form of propaganda because you're trying to influence people. That's what I meant and how I was using the word. His mass emails are a form of advertising. (Not to be more of a pedant than I already am, but the OED and wikipedia both support me on this definition.) If this whole debacle came out of his misinterpretation of my use of one word, that's regrettable. Can't you all run in your neon inappropriate for the weather hot pants without the race organizations that overcomplicate the whole process and then can't seem to pick a date (and block the park for other users). Just get together, get a friend with a stop watch and run till you turn blue if that's what you want to do. Why does a run need to be run by a corporation? For the record, I have never run in hot pants. but, when you run in pants, do you get hot? Whoa. I stand corrected. I *have* run in hot pants. The date thing is the main reason I’m holding off. I really, really want to run it, but I have another marathon on March 24th and so the February date is really the only conceivable date I could attempt 26.2 miles this winter/spring. I know that I could probably get a credit, but I don’t race that often and would rather spend my money on a race that fits into my schedule. I am very impressed you get up to 250 page views a day. Not really taking sides on this but hopefully it cools down. Thanks, Aron! Today is going to go down as one of my most-viewed days since I was on letsrun/reddit - I'm at 550 views! Damn, yo. Wow, why the haters? Seriously, if you don't want to sign up for it because the date is soft, then don't. End of story. Wow. Steve and NYCruns put on good, if not great, races that are the alternative to NYRR. The bashing all seems very unnecessary given that they're trying to bring more marathons to the city and we all like to run marathons! Right? Happy Thanksgiving. Oh good Amy! I am going to organize a race in midtown manhattan on New Year's Eve. Or the 4th of July. What does it matter? I will charge $150 and it might be the best marathon ever! Since I fully intend to increase the presence of marathoning in NYC I am happy I can count on your non refundable registration! Thanks!!! Wow, Tracey. Giant. Can. Of. Giant. Worms. Floating dates for any kind of race make me nervous. I have a life where if I commit, I'm all in. I can't just meander into a race. I'm not that kind of a runner. (Well, right now I'm a rehabbing, 10-week post peroneal tendon and ligament surgery runner, who can barely walk.) But yeah, I only go for the sure thing that I can put on my calendar in ink before I hand someone money. I have my "come back" run set up for April and know I'll still be taking it nice and slow, but I liked registering for it. I know the race is going to happen. The only reason for me not running that weekend would be crazy injury or death of a family member (which, unfortunately, have both happened). I was going to be silent in this thread, and just enjoy all the comments, but I feel like as a NYC runner my voice has to be heard too. That being said, Steve, I think you need to get a PR person to reply to emails, you seem to be overly defensive, and honestly I'm embarrassed for NYC Runs. I think I'm done adding my pointless 2 cents. I think NYC Runs does have it's own staff to reply to emails. From my correspondence, I got emails from an employee and from Steve - the ones from Steve were unsigned (but obvious in casual tone and unprofessional content). The ones from the employee (also obvious in tone, viz. truly professional) always ended with his full name and signature.